music by Willie Nelson 'FlexiTours' offers unique daytrip tours of the San Diego 'backcountry'- from the mountains to the deserts, and the small villages found there. From 'Dulzura' on old highway '94', to across the Anza Borrego Desert on S22 and up to the mountain lake of Cuyamaca, San Diego's backcountry offers amazing variety and scenery and experiences! Tours are planned around the annual and seasonal events held in these villages, and to the many attractions the backcountry of San Diego has to offer. Check out the villages, look over the Backcountry Calendar, then contact FlexiTours for your day in the country! ..
Visit the villages of Flexitour's Backcountry Daytrips with links to other pages on this site! 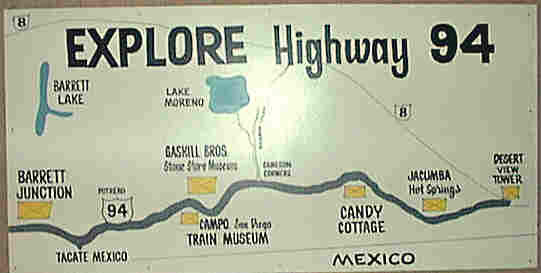 for Highway 94 History-CLICK HERE! please fill out the the email form below! 'FlexiTours' Website Navigation... find your interest and click below!